Today was reward day. Today, I have finished all my must-do’s for the week, picked up all our food donations for the big food drive ending at our church this coming Sunday, took care of house needs, took care of tiresome household chores. 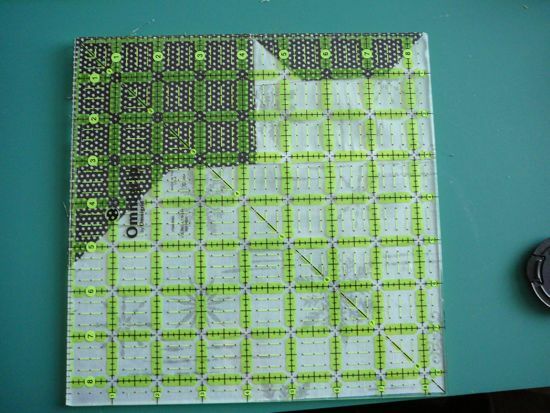 Today, I finally got to work on a quilt I have been thinking about for a long time. My favorite nephew and his wife are going to have a baby, due date on January 1st, how cool is that? Always before I have gone with brights, but I am thinking New Year Baby, and I am also remembering how The Happy Baby LOVES black and white prints, it is like he has never seen anything so wonderful. He could actually focus for minutes at a time, trying to figure out my daughter-in-law’s zebra stripe couch cushions. 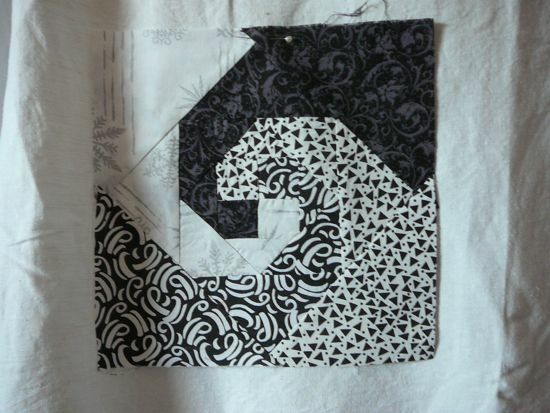 And I have been cutting out Snail’s Trail quilt patterns for a long time, but all that piecing has intimidated me. My nephew and his wife also have three cats. 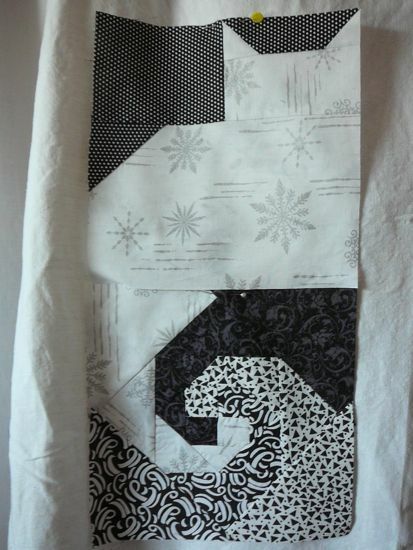 Looking through all my quilt clippings, I found a Quiltmaker quilt that was almost what I wanted. With my handy draft paper, I worked around until I got what I wanted. . . a set of four sets of four cats, and my stash of black and white prints. I was having so much fun. This quilt took more thinking than it took putting together. Once I had it figured out, it just created itself, and I was having so much fun! 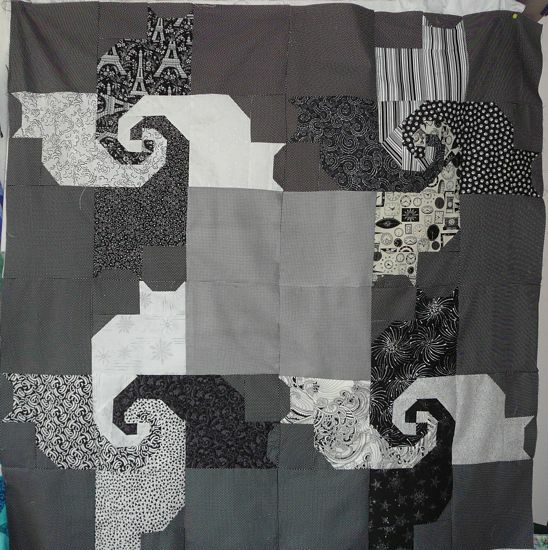 No, it is not a black and white photo; it is a black and white quilt. I am planning to applique little red hearts on the white kitties and little white bow ties on the black kitties. I have to think of something to do in the center of the quilt, but I am thinking that is a good place to applique the baby’s name and birth date when he gets here. Not all my imaginings turn out the way I imagine them. This one, I loved working on, and I love the way it came together. I love the way Snail’s Trail creates the circular motion and I love the way the cats create their own sort of modern border. I’m not even a big fan of black and white, but it’s fun to step out of the old comfort zone from time to time. This entry was posted in 2010, Attributed, Baby Quilt, Color Theory, Fabric selection, Gift, Machine pieced, Pensacola. I think I will 🙂 now I just need to pick out colors, which is always the hardest :p I like your black & white. . .I will make sure I link back here and let you know when I get it done!! I am really late to discover this posting, but, better late than never! I l-o-v-e your use of black and white prints. 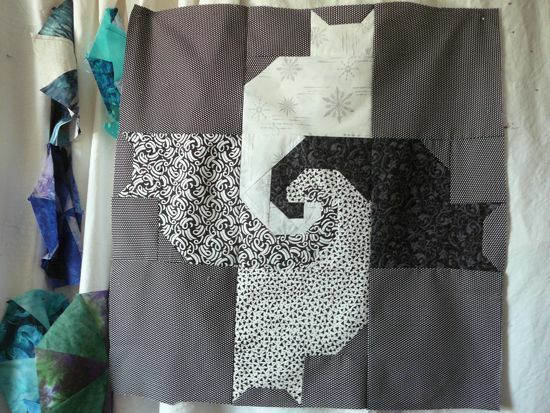 Your quilt top is especially interesting to me, because you met your cat ears on the left, instead of on the right, leaving an opening in the middle. (When the ears meet on the right, the design is filled in with cats.) I want to make this for a long time member of my Girl Scout troop, that is moving across the country, and, I couldn’t figure out how to make a space for the other girls to leave goodbye messages on the quilt. Yours is the only quilt top I have found that gave me the solution. THANK YOU!